What makes a dog bite injury to the hand so dangerous? Would the bone fractures then be considered open fractures? Does this risk level justify the early administration of antibiotics? Due to the tremendous amount of force behind a dog bite, many times – along with the superficial skin injuries – come damages to the flexor or extensor tendons. Even damages to joints or fractures to bones in the hand are possible. Bone fractures caused by dog bites typically are open bone fractures. Open bone fracture means there is an exposure of the bone connecting it to outside influences. Therefore open bone fractures are at high risk when it comes to infections. This is particularly true if bacteria from a dog´s tooth travel into the bone through the dog´s salivation. The dog bite seen here healed on the surface. The reddening which traveled to the back of the hand shows that there is an underlying severe infection. 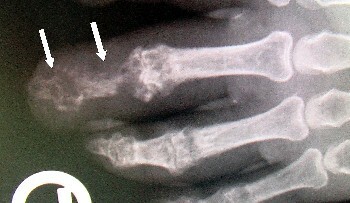 The x-ray image shows that the infection traveled deep into the bone. This situation was caused by a dog bite with open fracture. Both, the distal as well as the proximal interphalangeal joint have been destroyed. There is a severe bone infection going on (osteomyelitis). How high is the risk to contract an infection from a dog bite? The risk to contract an infection following a dog bite runs at about twenty-five percent. Surgery on a bite injury (regardless whether the aggressor was a dog, a cat or a human being) cannot be replaced by the administration of antibiotics. 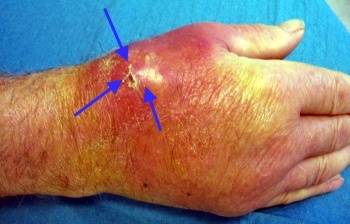 A sole antibiotic-based treatment can only be justified if the wound from the bite is restricted to the surface of the skin and appears to drain properly. There is, however, a substantial risk to underestimate the impact of an externally insignificant-appearing wound from a dog bite. In case of doubt it is advisable to proceed to surgical treatment including sharp debridement to remove the damaged tissue, while creating an ample drainage option. 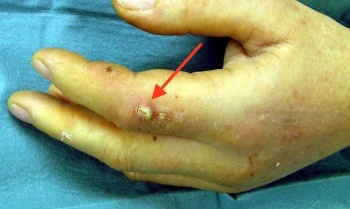 Despite the administration of antibiotics the “harmless” looking dog bite to the index finger seen here shows signs of a beginning infection on day two. Please note the reddening around the bite wound and the swelling of the back of the hand. “Waiting it out” in a case like this only leads to a progression of the infection. Showed opposite is a one-week-old dog bite injury. Despite immediate administration of antibiotic, the inflammation kept progressing which called for immediate emergency surgery. Further delaying the surgical intervention would only cause more tissue of the hand to become irreversibly damaged.